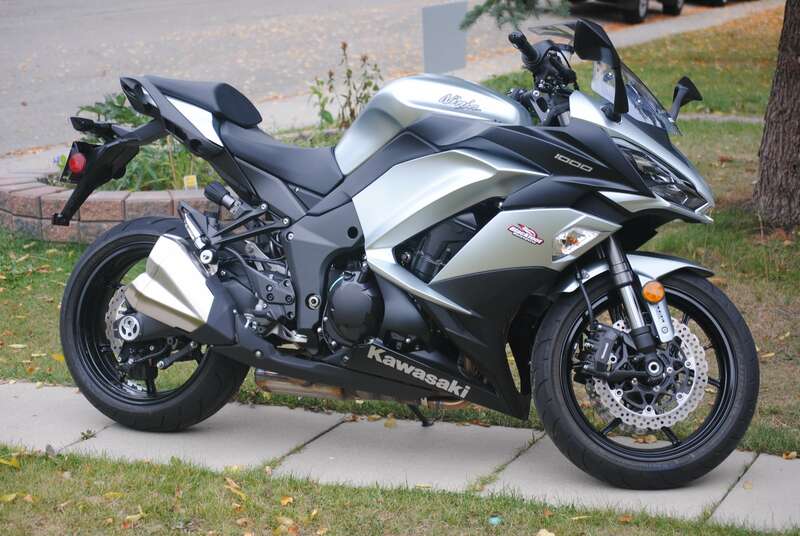 The Kawasaki Ninja 1000 ABS is a sport touring bike that I was wanting to review for a while. I like the aggressive styling of the bike and after sitting on it in the showroom, I know I wanted to take this Motorcycle for a test drive. I really like the way the bike feels when you are sitting on it. The handlebars are just back enough that you are sitting in a semi-upright sport touring position and it just feels right. I would like to thank Blackfoot Motosports in Calgary, Alberta for giving me the opportunity to take this amazing machine out for a romp. Please check out their website at Blackfoot Online. 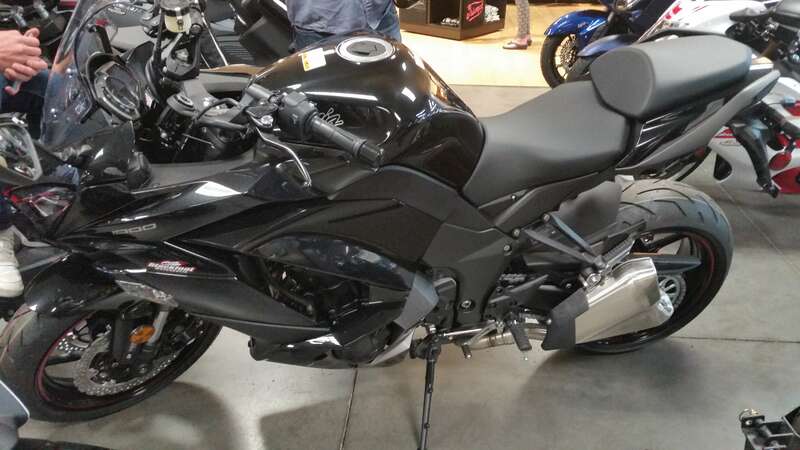 My first impression of the Ninja 1000 ABS was that it was a very nice looking bike. It has the look of a racer and the feel of a touring bike. The bike has a very nice stance, I am 5’9” and the seat was perfect for me. The handlebar position was not too far forward and did not feel awkward. 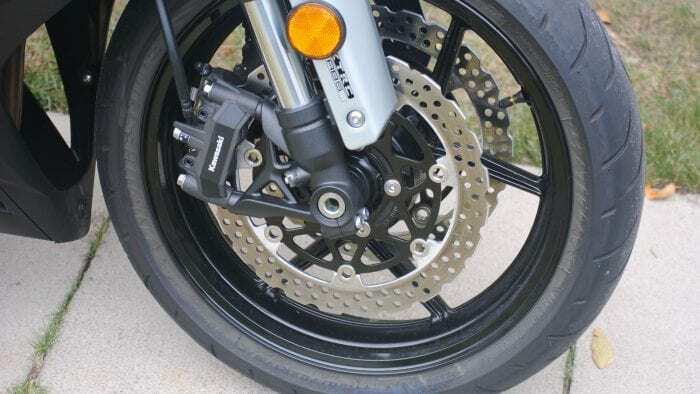 The footpegs were well positioned and I did not feel like my legs would cramp up even on a longer trip. 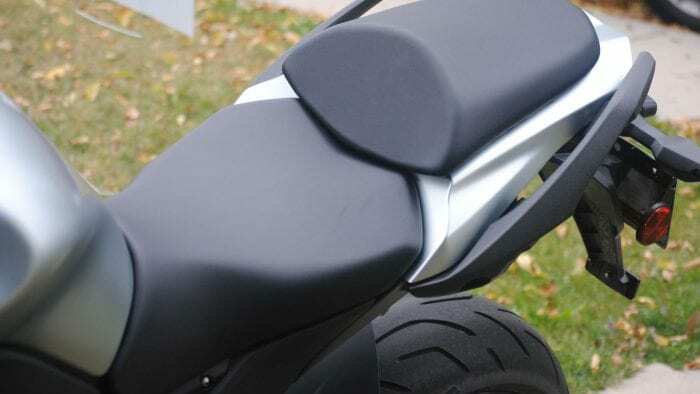 The seat was comfortable and provided adequate padding, and finally, the complete style of the bike makes it look much more expensive than it is. 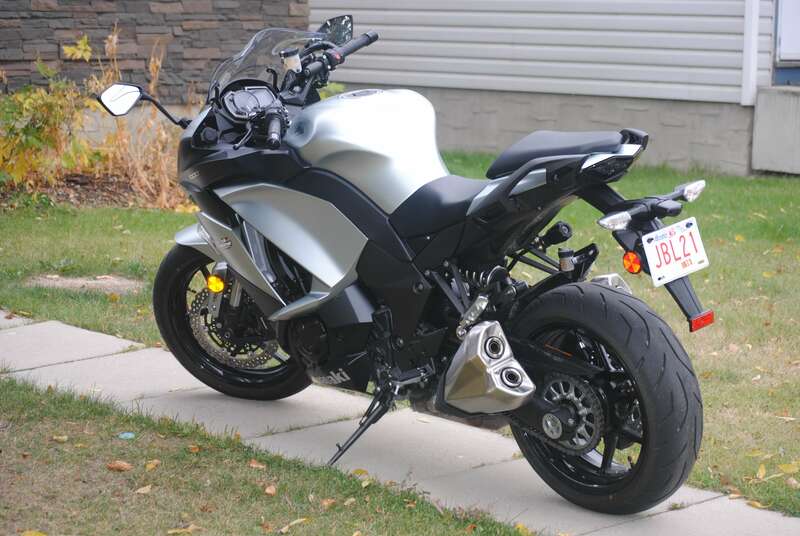 It was not very warm in Calgary when I picked up the Ninja from the dealer. In fact, that morning, I woke up to snow on the ground. By the afternoon it had cleared up and the weather did not call for snow for the immediate future. I picked up the bike at around 2 PM and made my way home. I took the long way back to my house and tested the Ninja in traffic. I was very pleased with the way this motorcycle handles itself in traffic. I had the power mode set on full power and I never changed it during the entire review. The bike was amazing in traffic. It did not feel out of place and was extremely good at cornering in the city. In my opinion, this motorcycle would be a wonderful commuter. It was in its environment in the city. I was a bit disappointed with how dim the instrument cluster is during the day. It is not very bright which is a bit annoying. I made it home and was admiring the looks of it as I was taking pictures for this article. The lines are very aggressive, yet it still looks refined. I found myself going outside on several occasions to just stare at the bike and admire the lines. A friend showed up and was quite impressed with the bike. He also loved the look of it and was very pleased when I started it up and he heard the exhaust note for the first time. 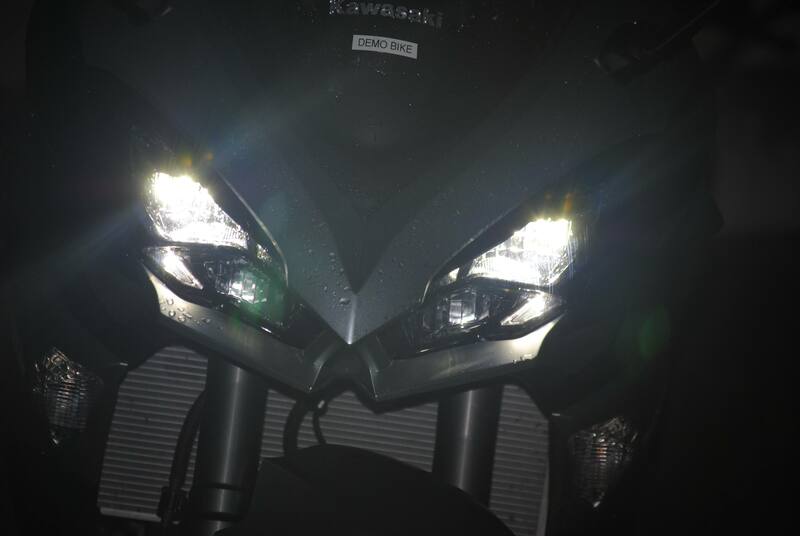 The lights on the Ninja are nice and bright. Illumination is not an issue with this bike at all. 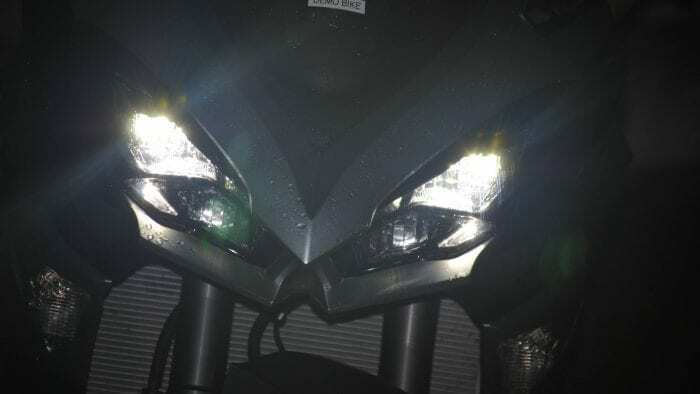 The LED headlight and tail light are crisp and clear. If only the signal lights were also LED. At night, the instrument cluster was well illuminated and easy to read. 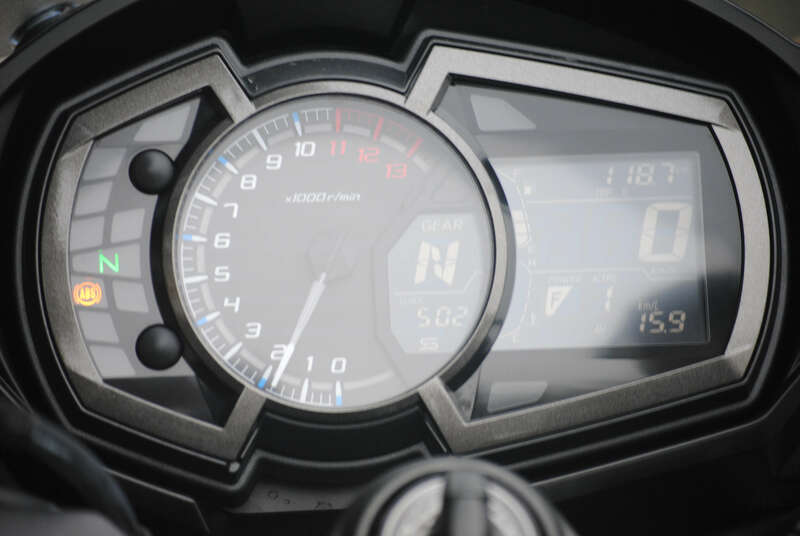 It is simple with an analog tachometer and a digital screen that shows your speed as well as the other functions such as the power mode, traction control settings, fuel etc… A bit utilitarian, but not overly cluttered with information. If it was this bright during the day, it would be a winner. The windscreen is adjustable. I set it up to the sharpest angle and took a ride on the highway. I was satisfied with the way it deflected the wind away from my chest and head. I did not feel any helmet turbulence at highway speeds. We decided not to do our usual Alberta Route 1A as it had snowed quite a bit the last few days and we did not want to take the chance to get caught up in a snowstorm. We headed east. The Ninja was excellent in this weather. Given that this was a demo bike with about 1000 Km on it from test drives, the tire was well broken in and the bike did not let the cold and damp stop it from doing its thing. I was amazed at how well the bike accelerated. The handling in the turns was excellent and the braking was very nice. I was not overly satisfied with the windshield in the rain. It did manage to disperse some of the moisture, but not all of it. My visor was bombarded with droplets during the entire time we were riding. 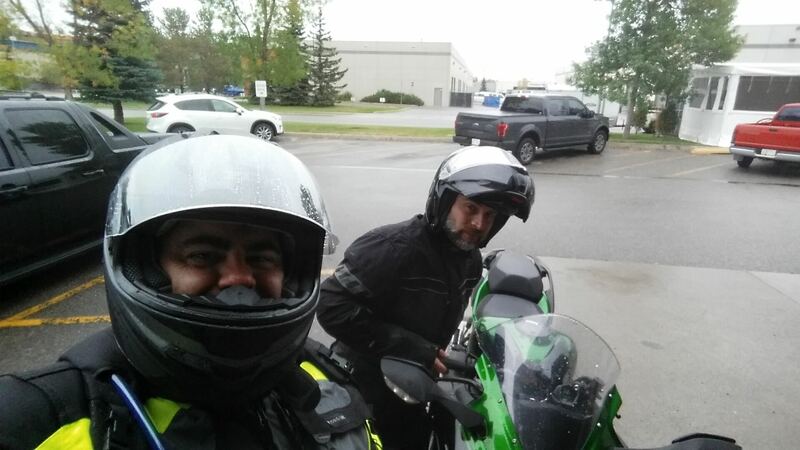 We rode for about 45 minutes and stopped in a small town east of Calgary. I was testing out a new Olympia X Moto 2 Jacket and Pant combo and I was not cold; however, my gloves were not up to the task. My hands were drenched and it was a bit discerning to see my left index finger as blue as if I had been eating blueberry pie. Jim and I discussed my predicament and decided to switch bikes for a while. He rides a Kawasaki H2SX SE and it has heated grips. My hands were able to warm up. Both bikes are similar, but the Ninja 1000 is nowhere near the H2SX when it comes to comfort and performance. I guess that is understandable given the difference in price. We kept riding for another hour and made our way back to Blackfoot Motosports. The brakes on the Ninja 1000 ABS are amazing. They stop this machine without any issues. I was very happy to see how well they performed in cold weather and in the rain. 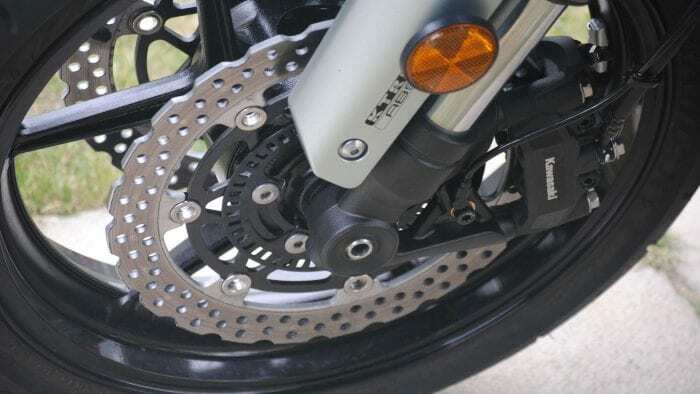 The ABS is smooth and has the Kawasaki Intelligent Anti-Lock Brake System (KIBS) gives you additional peace of mind in the event of an emergency maneuver. The seat on this bike is comfortable. It is not as comfortable as some more expensive motorcycles out there, but I would be able to do a long distance ride on this bike without too much complaining. It was firm, but not hard. The cushioning was adequate for longer trips and excellent for a commuter. The Ninja 1000 has good power down low that continues through the midrange and starts to take on a more aggressive attitude around 7,000 RPM. 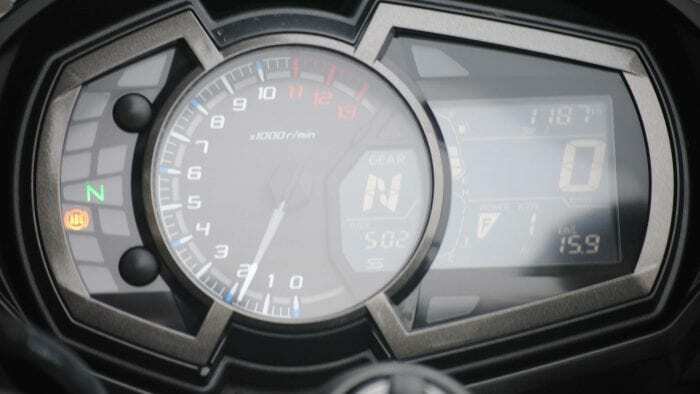 it has a nice controlled feel to it and in my opinion, the Ninja has an excellent sport touring powerplant. 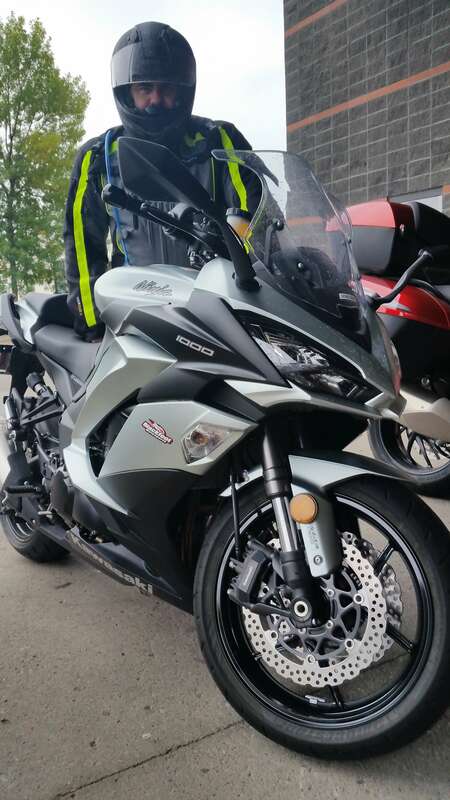 I was quite comfortable on the Ninja 1000 ABS. I found that the higher handlebars were a huge benefit. I did not feel like I was resting on my wrists at all. Once the wind pushed me back a bit, my shoulders and hands were very relaxed. As much as I like almost everything about the H2SX, I find that for me, the comfort level is better on the Ninja 1000 when it comes to the bars and the seat position. 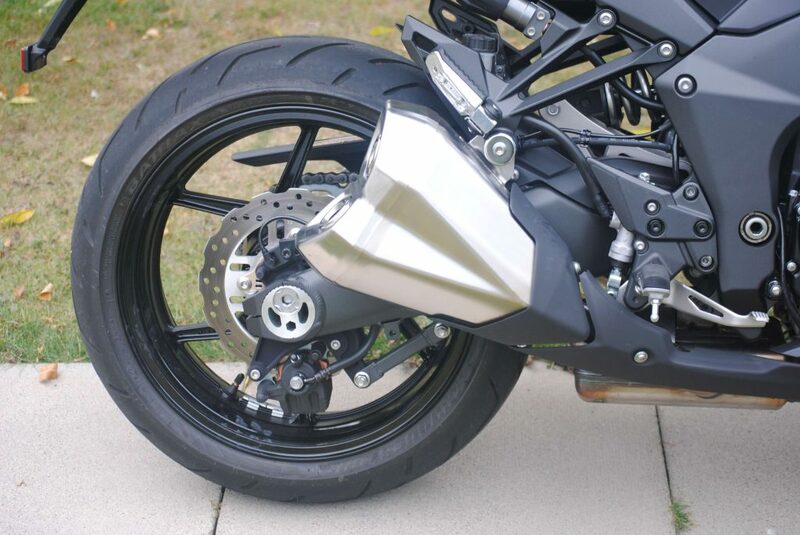 The Ninja 1000 ABS comes equipped with Bridgestone Battlax Hypersport tires. They work well, I found that I had very good traction at all times on wet and cold pavement. 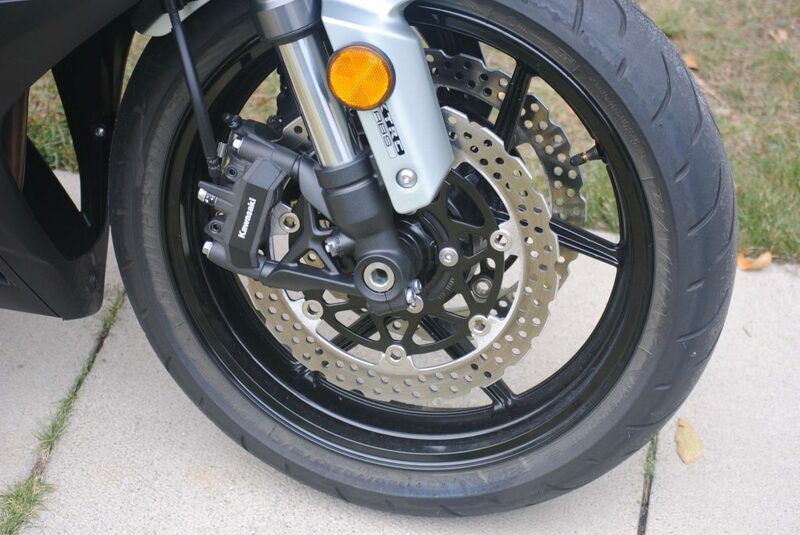 The Ninja comes with a 120/70-ZR17 tire on the front and a 190/50-ZR17 on the rear. 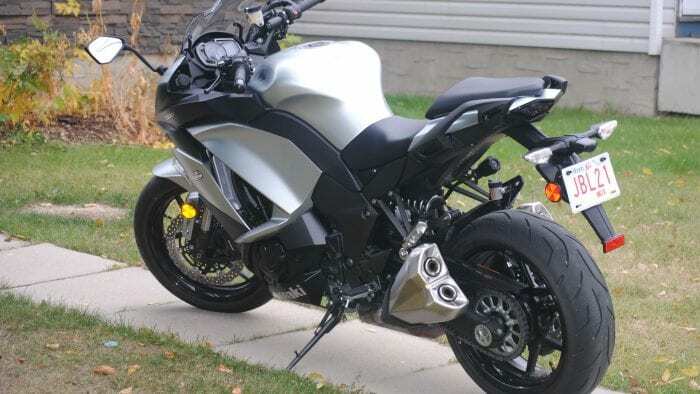 I rate the Ninja 1000 ABS a 4 out of 5 stars. I feel that the Ninja 1000 ABS has the styling of a more expensive bike. 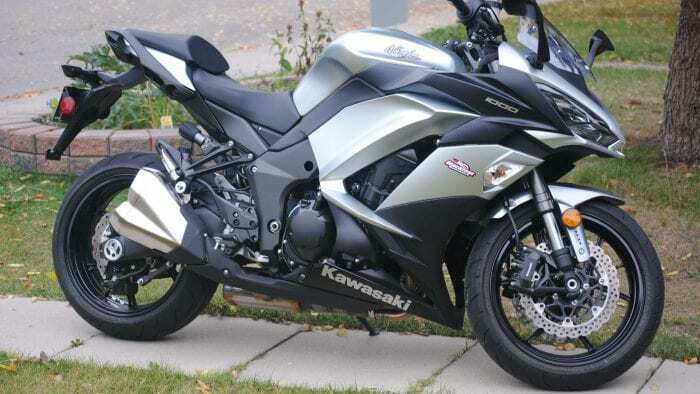 It is in line with the look of the H2SX and the ZX-10R. In terms of comfort, I have nothing but good things to say about this motorcycle. The seat position, the handlebars, the suspension are excellent. It handles like a dream. 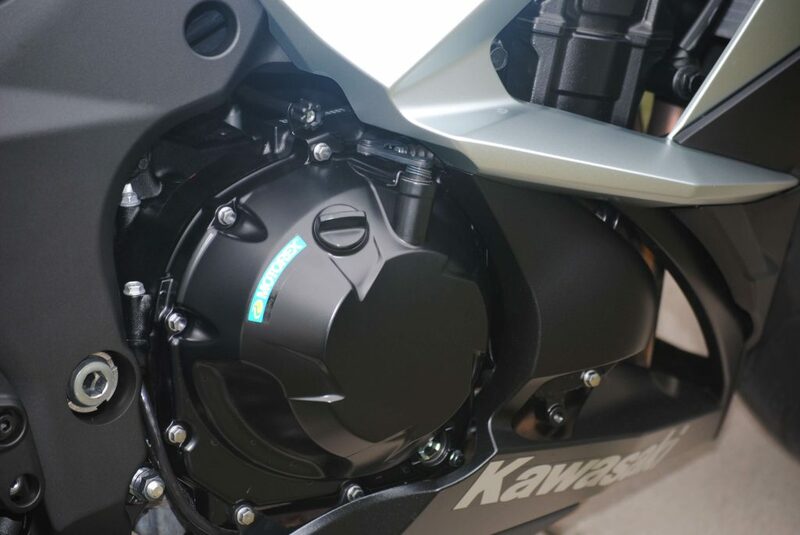 As far as power is concerned, the Ninja has plenty of power to satisfy most riders. It is very refined and with the traction control set a bit higher, I did not feel at any time that this bike was getting away from me. I would love for it to have a supercharger, but I appreciate all it gives in this price range. I was pleasantly surprised at how many features this bike actually has for the price it is. Excellent brakes with ABS and Anti-lock, traction control and corner management as well as power mode selection. 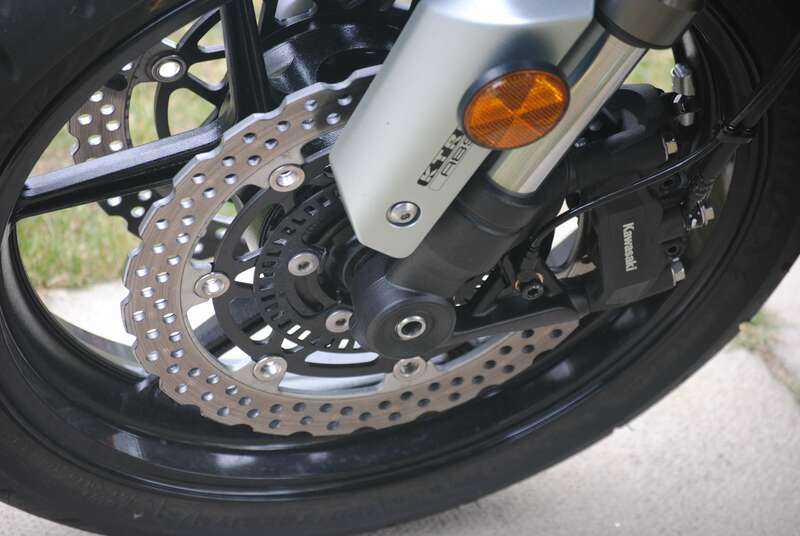 These features make the bike a contender in its class. Also, the fuel consumption of this bike is very good. The bike averaged 55 Mpg during this review. I was a bit disappointed in a few things. The display is very dim during the day. I wish it was brighter. It was difficult on a gloomy day to properly see the display. I can just imagine how hard it would be in the blazing sun. The windshield did well when it was not raining. I was hoping that it would have been excellent in the rain; however, it was mediocre. Finally, it was disappointing that something as basic as heated grips and cruise control is not included in this bike. I would almost like to see the price go up a bit and that these options would be included in the bike. 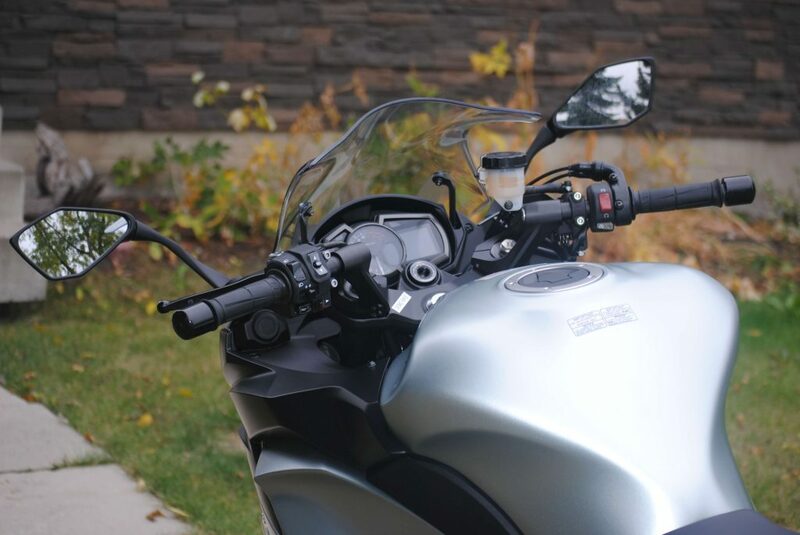 In my opinion, if you are going to position a motorcycle in the sport touring category, these items are a must. Despite these few things, I feel that the Ninja 1000 ABS is an awesome machine and it is a contender in the sport touring category. 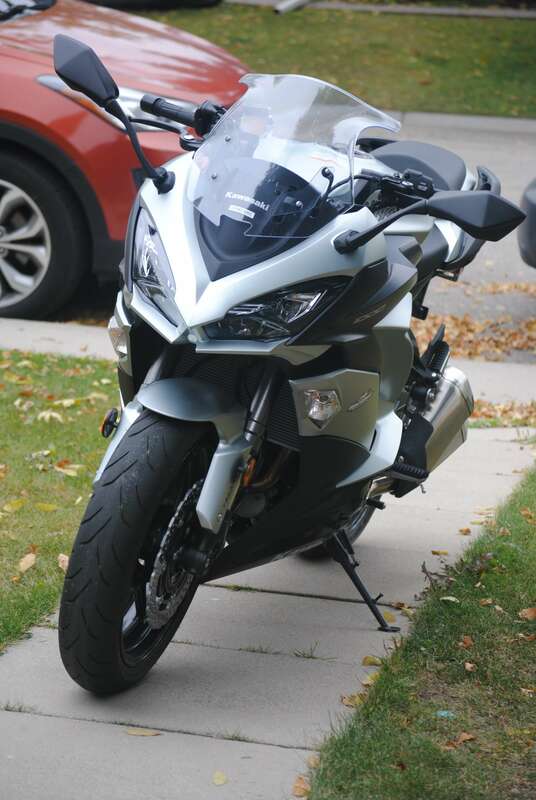 I recommend this bike to anyone that is thinking of getting into sport touring. 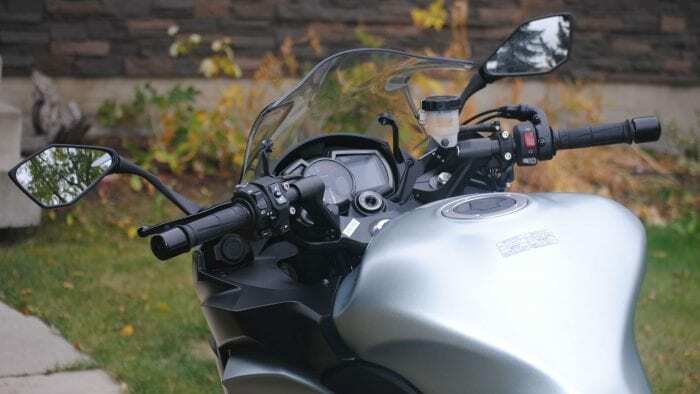 I would recommend that some of the options mentioned above be installed during the initial purchase of the motorcycle to make your experience that much more enjoyable. 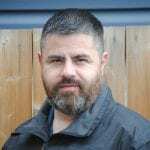 Hi Gerry Cote, nice review, thanks. I am planning on buying one of these bikes and was reading different reviews. I will test ride one soon and decide. 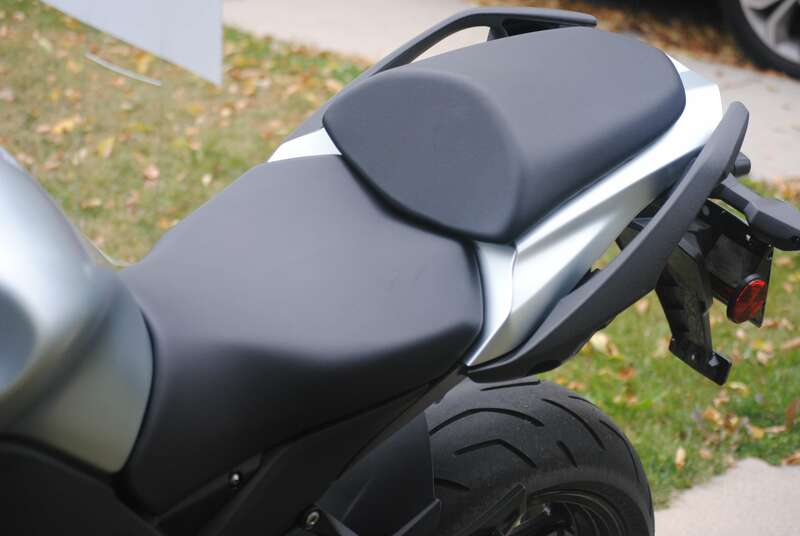 One important thing you forgot to mention was, that this sport touring motorcycle does not come with panniers. I’m assuming, and you know what happens when you assume, that this bike is not intended for long distance riding since they don’t come with bags and cruise control.